I have a lot to thank my grandmother for: my height, my love of crossword puzzles, my addiction to travel, my thirst for knowledge, and my appreciation of a good stiff drink. One thing I am less than thrilled about is my fair, Irish skin. Sure, I can build up a tan, but it takes several weeks (if not months) of patient sunscreen application…slowly but surely working my way from SPF 50+ to 30 to 20 and finally to 15. I will let Nivea thank my grandmother for that. While I can’t partake in the #1 Italian Summer Pastime (spending hours at the beach worshipping the sun gods), I am lucky in that the Roman beaches are also fantastic at night. A quick ride on the trenino will take you to Ostia, and to a boardwalk packed with people taking a passeggiata – evening stroll. Stop by any of the beachfront establishments to enjoy a drink, dinner, or discoteca. If you’re looking for a mellow evening and just want to chill on the sand with a group of amici, head to Vittoria Beach Bar. The bar itself is a mere 15 feet from the sea, and they’ve wisely chosen to keep their umbrellas open and lounge chairs out all night. Throw in some good music and the sound of Mediterranean waves and you have yourself a little slice of heaven. Let’s just say it’s swiftly becoming my late-night favorite. And who wants to do laundry on a Sunday night when you can go to Apericena at Tibidabu Beach? It’s an aperitivo, turned into dinner – 15 euro gets you a drink and access to an all-you-can-eat Italian buffet, complete with prosciutto, salami, pizza, grilled veggies, and pastas. 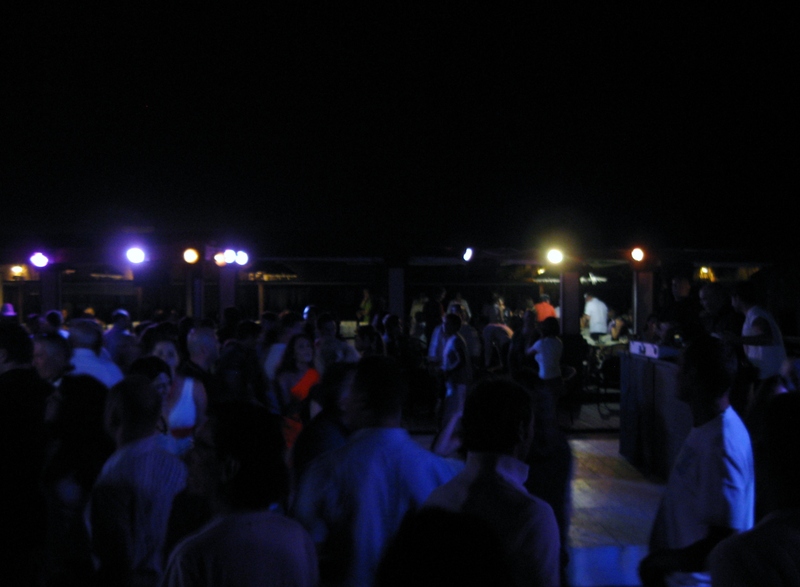 Once you’ve had your fill, head to the dance floor which really gets going at 10pm. Romans of all ages, shapes, and sizes get their groove on to the best of the 70’s, 80’s, and early 90’s. It is pretty much impossible not to dance when you see a 70+ year old man imitate his teenage grandson doing the YMCA. The fun ends at midnight, and you’re at home and asleep by 1am. A perfect way to end the weekend. p.s. I am fully adjusted to the Italian practice of eating dinner at 9pm (or later), going to sleep at 1am, and waking up at 8am. In the case of a later-than-usual night, or one-too-many drinks, well…that’s what cappuccini are for.